Aqui no sul de Alberta nós fomos calorosamente recebidos por pessoas associadas com o Red Crow Community College, especialmente Cynthia Chambers (professora de educação na Universidade de Lethbridge), Narcisse Blood (um anciã Blackfoot, da Red Crow), Ryan Heavyhead e Chefe Duane Mistaken (dois professores de Red Crow), Ramona Big Head (professora de educação na Universidade de Lethbridge), Nora (a bibliotecária no Red Crow) e Adrienne Heavyhead e Alvine Mountain Horse (ambas as quais trabalham com conhecimento ecológico dos Blackfoot). 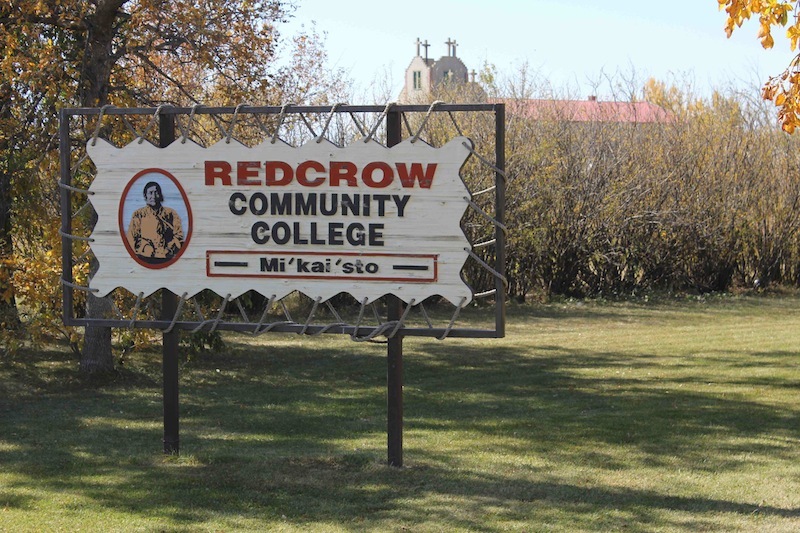 Red Crow Community College é uma faculdade pós-secundária espalhada por dois campos, um na Reserva Blood (uma das bandas da confederação de Blackfoot) a outra na cidade universitária de Lethbridge. 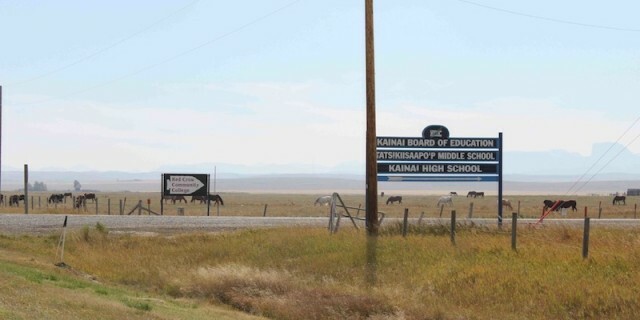 A faculdade tem cerca de 270 alunos e cerca de 40 funcionários e ensina uma série de cursos, como Inglês, Matemática, Estudos Sociais, Ciências e Kainai (Estudos Blackfoot), concebida para re-integrar alunos que estão fora da escola por um ano ou mais ao sistema universitário. O que fez a faculdade distinta de outras faculdades que conhecemos são os 2 anos do curso de estudo do Kainai (tribo dos Blood) que têm sido oferecido desde 2005. Neste curso, os alunos aprendem a língua Blackfoot com o Duane, história Blackfoot, geografia e religião com Narcisse, e com Ryan eles são introduzidos a como aprender com a terra e os animais da região, bem como a forma de usá-los para alimentos tradicionais..
Tivemos muitas horas de diálogos maravilhosos, aprendendo com Cynthia, Narcisse, Ryan, Adrienne, Alvine, Ramona e Duane durante a nossa estadia de 3 semanas. Os efeitos inspiradores do curso em vários alunos com qual falamos foi claro. Muitos falaram da redescoberta de sua história, da sua identidade, de reconexão com seus antepassados, com os avós, sua terra, e, mais importante, com um sentimento de orgulho e valorização de um modo de vida que tinha sido oprimido por muitas décadas. 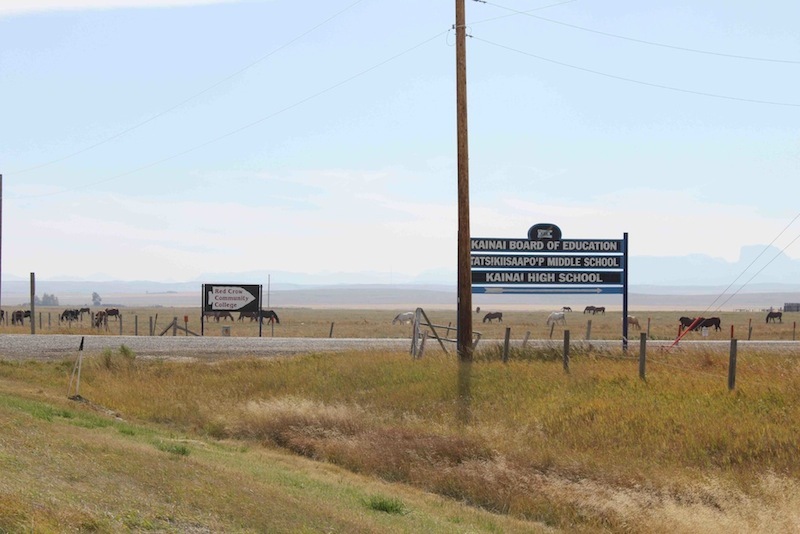 We feel very lucky to have started our journey to southern Alberta, Canada, in Blackfoot traditional territory after about 1,500 miles of driving and exploring. Our route was longer than perhaps needed, but we managed a couple of nights of camping in wilderness areas and a couple of National Parks… this map covers the route we took from Klamath Falls, Oregon to Fort MacLeod, Alberta, Canada with explanations embedded within the journey. We left Klamath Falls, Oregon (Kelly’s hometown) in early September and headed east to spend a first night camping in Steens Mountain Wilderness area. 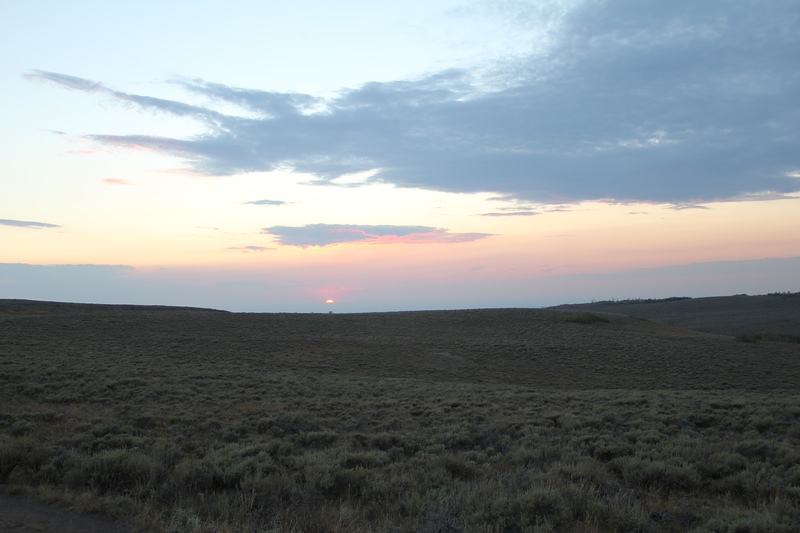 Steens is remotely situated in southeastern Oregon. This section of Oregon is one of the least populated areas of the continental United States, only 7,000 people live within a county that is at least 4 times the size of the state of Rhode Island. 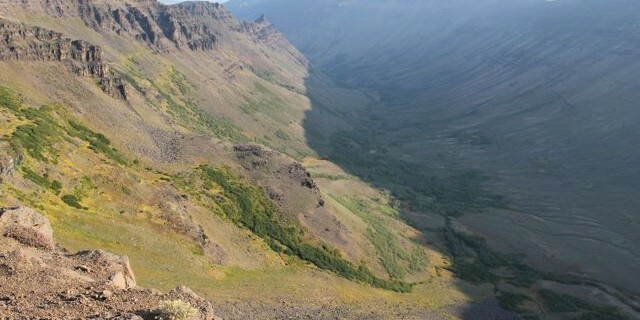 Steens has dramatic glacially carved canyons. The highest point is over 9,000 feet in elevation. 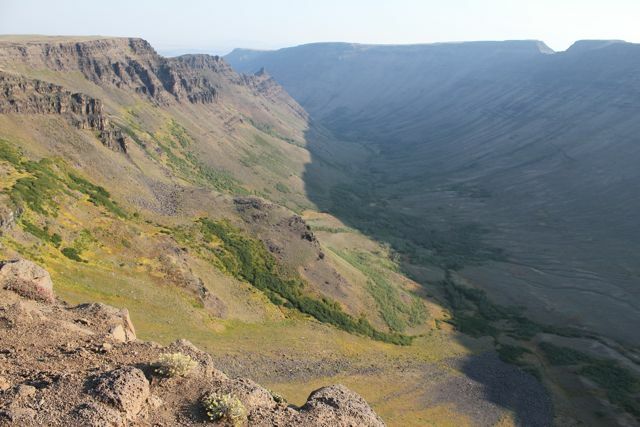 Photo taken by Kelly of Kiger Gorge, one of several glacially-carved canyons at Steens Mountain Wilderness area. During our first night, at Steens, as darkness crept in, the sky beheld an intense clarity and we laid on the ground to witness the entire Milky Way traversing the sky amidst untold numbers of stars. Photo taken by Kelly at Steens Mountain Wilderness Area at sunset, looking away from Fish Lake after we set up camp for the night. We continued our journey across the desolate but strikingly beautiful high desert of eastern Oregon, passing but a handful of cars over a 4-hour stretch until we reached the Idaho border. Crossing Idaho was anticipated for each of us as Kelly had not been here since childhood and it was Udi’s first time in the state. Unfortunately, wildfire smoke seemed to blanket the entire state and there was limited viewing as we drove toward the Wyoming border. 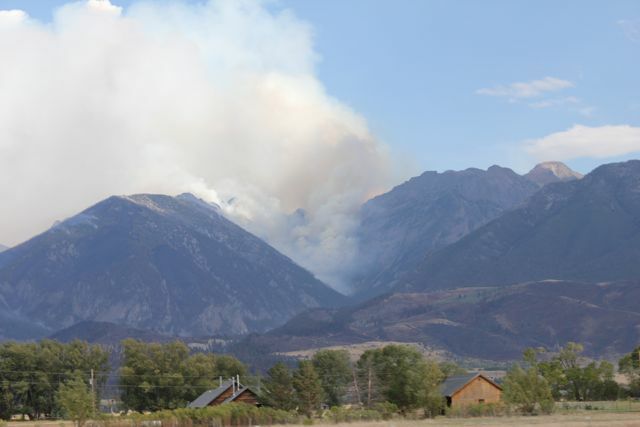 Photo taken by Kelly about 20 miles north of Yellowstone National Park, in Montana of a huge wildfire in the Absaroka Mountains. This summer, across all states in the western US, there were more wildfires than ever before. Late summer is now referred to as ‘fire season’ and is expected to get worse in the years to come, particularly as the climate becomes increasingly drier with more serious droughts expected to occur. Nearly all of the wildfires across the western US were from lightning. The increase and intensity of wildfires is related to climate change. This was but one instance in which we directly witnessed the effects of changing climate patterns. 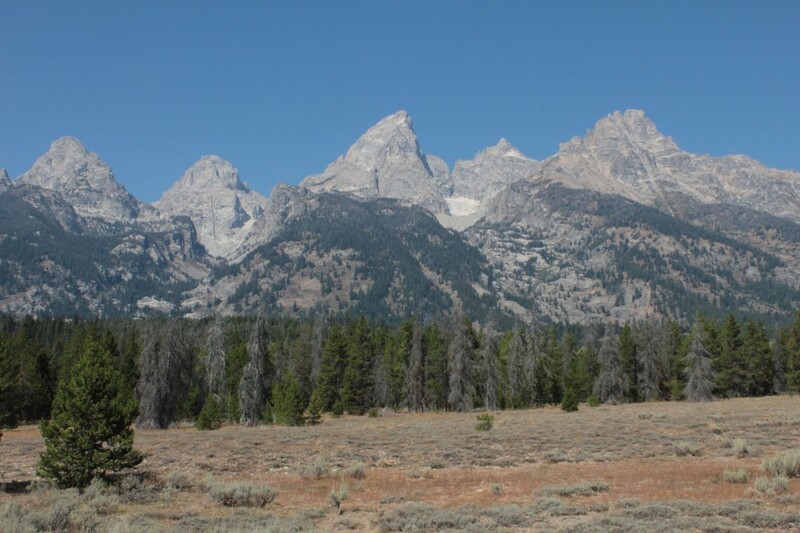 Photo taken by Udi of the Grand Tetons. 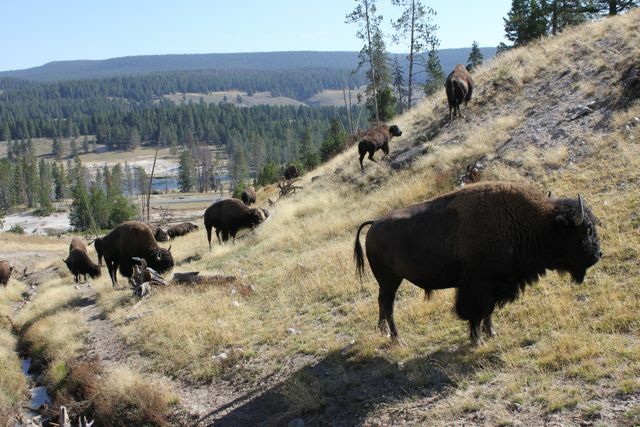 When we reached the Wyoming border, we turned north, heading slowly through Grand Tetons National Park and then camping for a night in Yellowstone National Park. Both National Parks are a feast for the senses, dramatic peaks rising up from a valley floor (that is the Tetons), old-growth ever-green forests, crystal-clear and fast-flowing rivers, steaming geysers and colorful pools of boiling waters and mud and an array of wildlife that are rarely seen elsewhere in the continental US, including grizzly bears, wolves, moose and buffaloes. 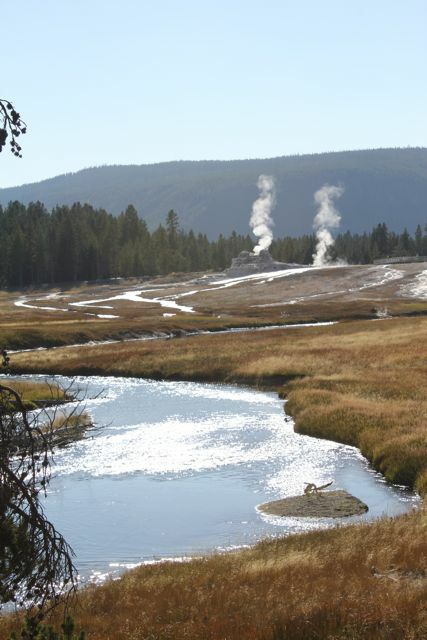 Photo taken by Udi near to Old Faithful geyser, Yellowstone National Park. Sleep that night camping at Yellowstone did not come in abundance, as the temperature plunged below freezing and the bugling of the male elks (it being mating season) was not exactly a soothing sound. However, we immensely enjoyed the natural wonders of both parks and reluctantly exited at the north end, entering into Montana. Photo taken by Udi of us (at least our ‘shadow side’) in front of a colourful boiling pool near to Old Faithful geyser. The drive across Montana was relatively clear until we reached Billings, when again the air was saturated with wildfire smoke. We drove as far as Missoula before spending another night and leaving the next day with the anticipation and excitement of traversing Glacier National Park before crossing into Canada.